Our new 1 1/2" wide Signature Belt is made from Wickett & Craig vegetable-tanned "English Bridle" leather with a British tan canvas inlay. Established in 1867, Wickett & Craig is the leading North American producer of vegetable-tanned leathers using a 200+ year old, painstaking process of converting raw hides into leather by treating with tannins extracted from environmentally friendly materials of vegetable origins. The result is a supple, strong leather with a mellow, natural brown color. Two sturdy leather tabs are sewn to the body of the belt at each end with attractive box stitching, and the entire belt is lined with waxed, natural vegetable-tanned leather. 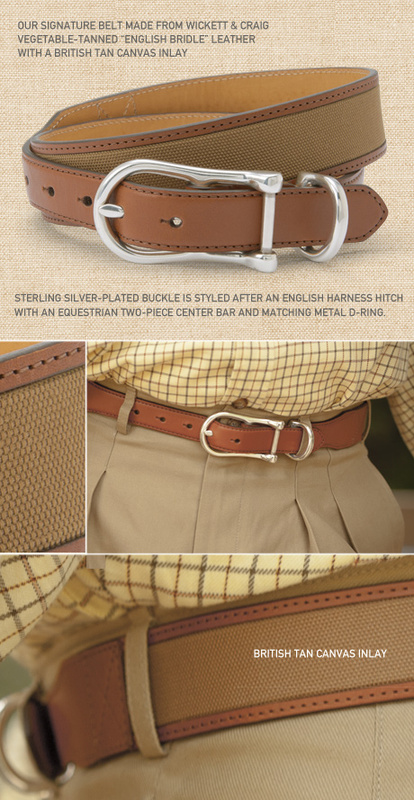 The sterling silver-plated buckle is styled after an English harness hitch with an equestrian two-piece center bar and matching metal D-ring.